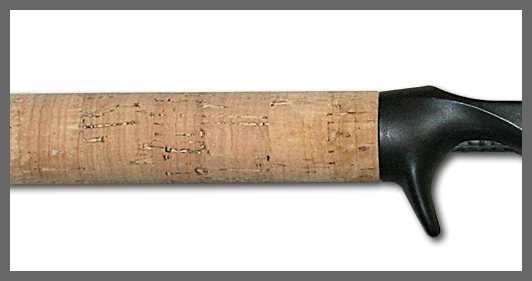 Custom Angle Rod products feature the superior action and performance of the spiral wrap (reverse wrap) on most baitcasting rods. Custom Angle Rods did not invent the spiral wrap, we have perfected it. 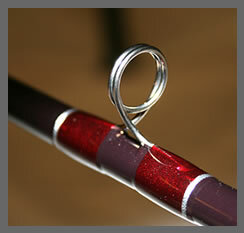 The spiral wrap, sometimes referred to as the reverse wrap, Robert's wrap, acid wrap or Missouri wrap has been used by rod crafters for quite some time. The spiral wrap is the method of wrapping a rod by placing some guides on the top and side of the rod blank and the majority of the guides are then placed on the bottom of the rod blank, hence the term spiral wrapped rod. 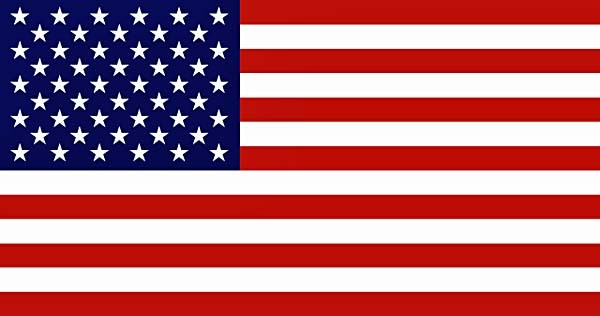 This design concept is believed to have been introduced around 1909. There are many different variations of a spiral wrapped rod. Normally, the first few guides are off set to one side of the blank. These guides are referred to as stripper guides. 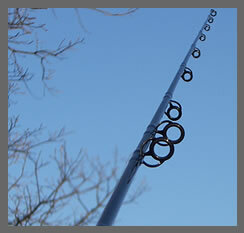 They direct the line from the reel, on top of the rod, to the guides located on the bottom of the rod. 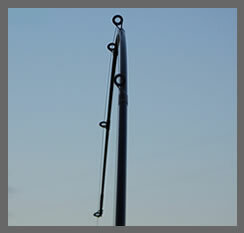 Custom Angle Rods uses two stripper guides placed on the right side of the blank for right handed reels or on the left side for left hand reels. The remaining guides are set on the bottom of the rod blank. The tip is aligned with the ring down matching the guides. Note: Fisherman who use a left handed reel should choose the online option for lefties, or special order from your nearest dealer. 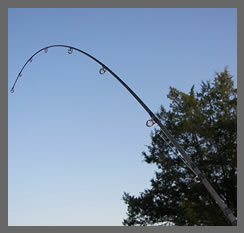 The line on all conventional rods (rods with guides on top of the blank), under load will slip to either the right or left side of the blank at the bend. This forces the guides over to the side and results in torque transmitted to the reel seat. When fighting a fish, you are also fighting the torque at the reel seat. Most rod companies have changed to single foot fly rod guides and increased the number of guides in an effort to reduce torque. They cannot eliminate torque! When a fish changes direction the fisherman instinctively reacts in the opposite direction. This forces the line to cross over the blank at the bend. This action will produce an audioable click as the line passes over the blank. This crossover of the line will produce heat and eventually the rod and/or line will fail at the point where the line contacts the blank. A reverse wrapped (spiral wrapped) rod has no torque at the reel. Since the guides are already on the bottom the load is straight down. The line never touches the blank and there is no cross over point. The second advantage of the spiral wrapped rod is sensitivity. The reverse wrap (spiral wrap) has the unique ability to transmit more of the bite energy and vibration to the handle. You will feel even the slightest bite with such an impact that there is no Question. You just got bit, SET THE HOOK!!! 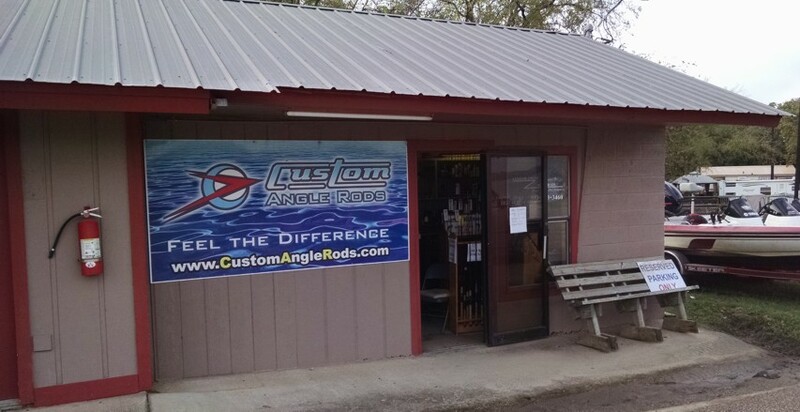 At Custom Angle Rods, we don’t cut corners; when possible every guide from the reel seat to the tip is double footed adding quality, strength, and confidence to the tools you use on the water. Exceptions include, spinning rods, and rods with micro guides. You can feel the quality in a Custom Angle Rod, from the hand reamed corks to the perfect alignment of all of the rod’s components. Feel the difference. Finding the right rod for you!